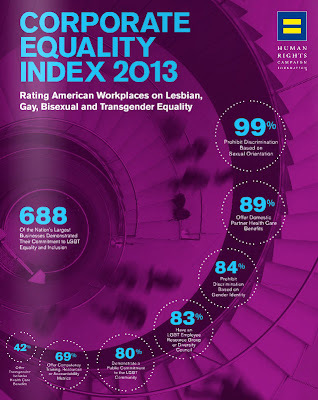 In the 2013 CEI, released today, a record 252 businesses achieved the top rating of 100 percent, earning the coveted distinction of "Best Places to Work for LGBT Equality." As a point of comparison, 13 businesses earned a 100 percent in the inaugural CEI 11 years ago, demonstrating that a new normal has arrived. The policies, benefits and practices businesses must implement to earn a perfect score are best-in-class demonstrations of corporate commitments to LGBT workers. While basic protections for LGBT employees have become the norm, record numbers of American businesses have also updated their larger benefits packages, adding "soft benefits" for LGBT workers, including things like retirement benefits to domestic partners and relocation assistance. With benefits accounting for roughly 20 percent of an employee's compensation, companies recognize this as a matter of equal pay for equal work. Over the past 11 years, the CEI has become the gold standard for corporate policies and practices related to LGBT employees and their families. The CEI rates companies on 40 such policies and practices. A total of 889 businesses have been rated in the 2013 CEI, including the entire Fortune 500. This year a record 293 of the Fortune 500-ranked businesses have an official CEI rating, with the other 201 rated based upon publicly-available data.